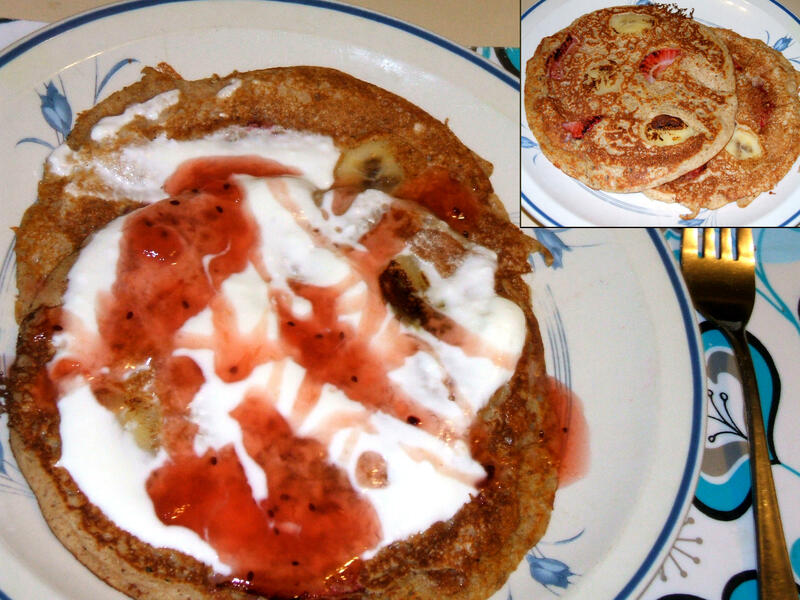 Our unique banana-strawberry pancakes Eugenio come alive when garnished with natural plain yogurt and our exclusive tangy sweet black plum-gooseberry jam. You can also enjoy our pancakes with traditional maple syrup or other syrups, and other jams would probably work well too. In an appropriate large bowl, add all flours, baking powder, and salt. In a smaller bowl beat the egg, oil, yogurt, milk, and water. Add these liquids to the dry ingredients in the large bowl and beat well until the mix is uniform. a bit more until surface is brown. Remove from frying pan and transfer unto a dinner plate. Repeat process. Top your pancakes with your favorite syrup or our plain yogurt and black plum-gooseberry jam and enjoy with a cup of coffee or tea, or your favorite drink.